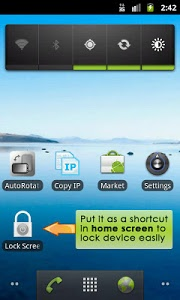 'Lock Screen App' can lock your device easily. 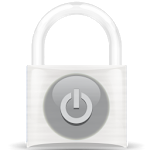 Do you feel inconvenient to lock your device using the power button? 'Lock Screen App' is a tiny app that can help you lock easily (without power button). Moto disallows lock screen in their OS updates, so it would not work on moto devices after updates and new device like Droid 3. I have reported it to moto, but they did not agree to fix! 2. 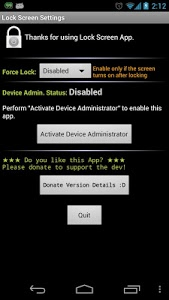 For device running Android 4.X, sometimes flashing (screen on then off again) may happen, try to enable 'Force Lock' in Lock Screen Settings to fix it. 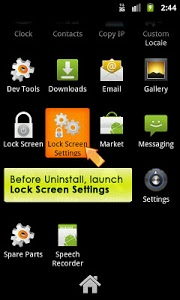 However, the dev cannot guarantee that it could run / uninstall on all devices [coz I don't have all the devices]. If you encounter problem with you device, feel free to drop me an email! 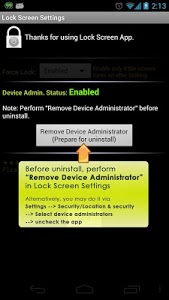 Locking Screen in Android requires the user of device administration function, you must deactivate device administration *BEFORE* uninstall to avoid error! 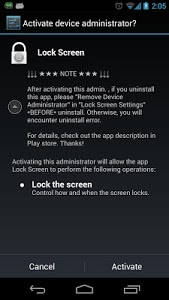 •Go to "Lock Screen Settings" (in launcher) -> "Remove Device Administrator"
•Go to Settings -> Location & security (or Security) -> Select device administrators -> Uncheck this app. 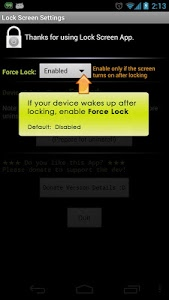 2.For device running Android 4.X, sometimes flashing (screen on then off again) may happen, try fix it by enabling 'Force Lock' in Lock Screen Settings. Similar to "Lock Screen App"